For other people with the same name, see William Sampson. William Thomas Sampson (February 9, 1840 – May 6, 1902) was a United States Navy rear admiral known for his victory in the Battle of Santiago de Cuba during the Spanish–American War. He was born in Palmyra, New York, and entered the United States Naval Academy on September 24, 1857. After graduating first in his class four years later, he served as an instructor at the Academy, teaching physics. In 1864, he became the executive officer of the monitor Patapsco of the South Atlantic Blockading Squadron and engaged in sweeping torpedoes off Charleston, South Carolina. He survived the loss of that ironclad on January 15, 1865, when she struck a torpedo, exploded, and sank with a loss of 75 lives. Following duty on the steam frigate Colorado with the European Squadron, another tour as instructor at the Naval Academy, and in the Bureau of Navigation of the Navy Department, he served in the screw sloop Congress. He then commanded the Alert, the training ship Mayflower, and the Swatara while on duty at the Naval Academy. During the next years, he was Assistant to the Superintendent of the United States Naval Observatory, then Officer-in-Charge of the Naval Torpedo Station at Newport, Rhode Island. On September 9, 1886, he became Superintendent of the Naval Academy. He was promoted to Captain on April 9, 1889, reported to the Mare Island Navy Yard to fit out the protected cruiser San Francisco, and assumed command when she was commissioned on November 15, 1889. He was detached in June 1892 to serve as Inspector of Ordnance in the Washington Navy Yard and was appointed Chief of the Bureau of Ordnance on January 28, 1893. He assumed command of the battleship Iowa on June 15, 1897. On February 17, 1898, he was made President of the Board of Inquiry to investigate the destruction of the Maine. On March 26, 1898, he assumed command of the North Atlantic Squadron, with the temporary rank of Rear Admiral. The United States declared war against Spain on April 25, 1898; and, eight days later, Admiral Cervera's fleet sailed from the Cape Verde Islands for an uncertain destination. Rear Admiral Sampson, in flagship New York, put to sea from Key West. Sampson's early involvement in the conflict included his supervision of the Cuban blockade, which lasted for the duration of the war, as well as the bombardment of the city of San Juan on May 12, 1898. After initially being sent to blockade Havana itself, Sampson was given orders to intercept Admiral Cevera's squadron, but with only a vague notion of Cevera's current location, he was unable to actively pursue. Awaiting further information on Cevera's whereabouts, Sampson sailed east to San Juan and carried out a bombardment on May 10 that lasted several days, dealing minor infrastructural damage to the city. After this preliminary bombardment, Sampson helped lead a land-sea attack on San Juan, along with General William Shafter, taking the city. On July 1, following the successful invasion, Sampson returned to Cuba, reinforcing the blockades in Santiago and Cienfuegos. On May 29, Elements of Sampson's command spotted Admiral Cevera's squadron moving into Santiago harbor and the naval presence there was greatly increased to prevent Cevera's escape. On the morning of July 3, 1898, Cervera's fleet came out of the harbor. Sampson was ashore at a conference with General Shafter, making plans for a coordinated attack on Santiago. Rear Admiral Winfield Scott Schley was in command of the Flying Squadron in Sampson's absence and met the Spanish fleet, completely destroying every Spanish vessel in a running sea battle lasting five hours. The next day, Rear Admiral Sampson sent his famous message: "The Fleet under my command offers the nation as a Fourth of July present, the whole of Cervera's Fleet". Sampson's message omitted any mention of Schley's leadership in the battle, leading to a controversy as to who was responsible for the victory. While Sampson also arguably played a significant role in the victory, having laid down the strategic framework and determining the favorable positions of his own forces, it was of course Schley who had actually commanded the fleet during the battle. Schley appealed for a court of inquiry, which he got in 1901. In the Navy, the quarrel was so divisive that the rank-and-file identified themselves as either a "Schley man" or a "Sampson man." The court of inquiry heard testimony in support of Schley by his own men and, despite some criticism of Schley, exonerated the commander of the Flying Squadron. 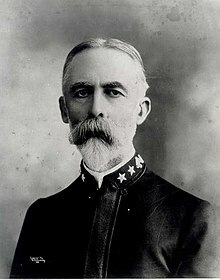 After the Battle of Santiago Bay, Sampson was appointed Cuban Commissioner on August 20, 1898, but resumed command of the North Atlantic Fleet in December. He became Commandant of the Boston Navy Yard in October 1899 and transferred to the Retired List on February 9, 1902. Sampson was a companion of the Military Order of the Loyal Legion of the United States and the Military Order of Foreign Wars. He was awarded an honorary doctorate (LL.D.) by Yale University in October 1901, during celebrations for the bicentenary of the university. Rear Admiral Sampson died in Washington, D.C., a few months later and was buried in Arlington National Cemetery. Note – Admiral Sampson was one of only four members of the United States Armed Forces entitled to wear a medal with his own image on it. The others were George Dewey, John Pershing and Richard E. Byrd. Four destroyers of the Navy have been named USS Sampson in his honor. The United States Naval Academy's Sampson Hall, which houses the English and History departments, is named in his honor. The former Sampson Naval Training Base, that became the Sampson Air Force Base and is now a New York State Park on the eastern shore of Seneca Lake were named in his honor. Approved by President Roosevelt in 1942, 498 buildings were constructed on 2,500 acres (10 km2) of farmland in the Finger Lakes near Palmyra, New York by 15,500 workers in 270 days so that 411,000 sailors could be trained before the facility closed in 1946. The facility was converted to the Sampson Air Force Base for the Korean War and between 1950 and 1956 over 300,000 airmen had their basic training there. Even though the facility is now the Sampson State Park known for its herd of white deer, it has returned to military duty now that the Sampson Veterans Memorial Cemetery has been completed. A Brooklyn, New York elementary school PS 160 was named in his honor. The steamship Admiral Sampson was named in his honor. The SS Admiral Sampson was built in 1898 and sank in Puget Sound in 1914. Both the elementary and high school at Guantanamo Bay Naval Base are named in his honor. Detroit Public Schools has a school that bears the name William T. Sampson Elementary School located at 6075 Begole Street, Detroit, MI 48210. It is no longer used and has been shuttered. ^ a b c "William Thomas Sampson". World Book. 15. Field Enterprises. 1958. ^ "United States". The Times (36594). London. October 24, 1901. p. 3. ^ "Relocation". W.T. Sampson Elementary/High School. CNIC, Naval Station Guantanamo Bay, USN. Retrieved January 20, 2010. This page is based on the Wikipedia article William T. Sampson; it is used under the Creative Commons Attribution-ShareAlike 3.0 Unported License (CC-BY-SA). You may redistribute it, verbatim or modified, providing that you comply with the terms of the CC-BY-SA.